Nigel G. Mitchell - Author, Blogger, Geek: 10 Things You Probably Didn't Know About "Chitty-Chitty-Bang-Bang"
10 Things You Probably Didn't Know About "Chitty-Chitty-Bang-Bang"
Chitty-Chitty-Bang-Bang was one of my favorite books when I was a kid. I admit, I was first inspired to read it from the 1960's movie of the same name. I just discovered October 2014 was its fiftieth anniversary, so here's some trivia as a delayed memorial for the occasion. 1. 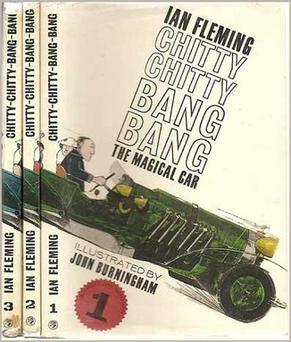 Chitty-Chitty Bang Bang was written by Ian Fleming, author of the James Bond series of novels. 2. Fleming would often tell his son Caspar a bedtime story about a wondrous car every night. 3. While recovering from his second heart attack, Fleming was encouraged by a friend to write his bedtime stories into a book. Chitty is the only children's book he ever wrote. 4. Chitty-Chitty-Bang-Bang was inspired by Chitty Bang Bang, a series of customised Mercedes built and raced by Count Louis Zborowski in the 1920's. Zborowski allegedly named his cars after the noises the engines made. 5. Chitty-Chitty's flying ability was inspired by the aerodynamic designs of Zborowski's cars, which incorporated parts from zeppelins. 6. Jemima Pott, the daughter of the main character, is named after the daughter of Fleming's previous employer. 7. Chitty-Chitty-Bang-Bang was originally serialized in the Daily Express newspaper in five episodes over the course of a week, from October 19-23, 1964. 8. The original manuscript had a recipe for fudge that, in real life, wasn't good. Fleming's editors spent a whole day trying different fudge recipes to make a better one. 9. Fleming died of a third and final heart attack two months prior to the book's publication. 10. In 2011 and 2012, author Frank Cottrell Boyce wrote two sequels in the collection, Chitty Chitty Bang Bang Flies Again and Chitty Chitty Bang Bang and the Race Against Time.